The Linksys EA7500 Max-Stream™ AC1900 MU-MIMO Gigabit Wi-Fi Router supports Wireless Repeater mode. The Wireless Repeater mode uses one of the wireless network bands to connect to your upstream router. This article will give you instructions on how to configure your Linksys EA7500 to Wireless Repeater mode. Only one frequency band on your router will be used for repeating the signal. Determine which frequency band to repeat. Both frequency bands, however, can be used for broadcasting to connect other clients. Decide which frequency band you are going to use in Repeater mode. Both frequency bands in Wireless Repeater mode will still broadcast and clients will be able to connect to either of those frequency bands. You can edit the wireless settings in the Wireless widget for both frequency bands. 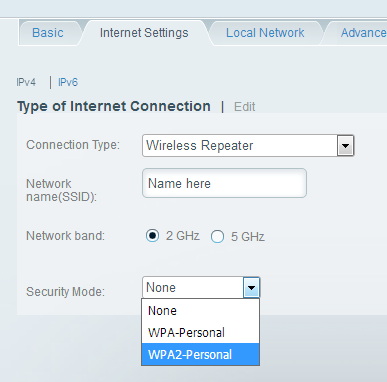 Configure Repeater mode and select the 2.4 GHz frequency band on the Linksys Smart Wi-Fi Router. Both frequency bands will broadcast even if one is being used in Repeater mode. You can customize both frequency bands’ wireless settings on the Wireless widget. To edit or change the Repeater settings, go to Connectivity > Internet Settings tab. Do not use the WAN / internet port. 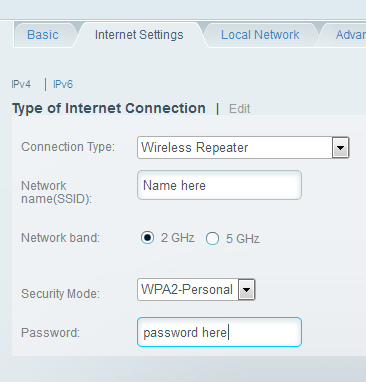 Log in to the router's web-based setup page in Wireless Repeater mode via the IP address only. IMPORTANT: Obtain the wireless settings of the main router or access point first before proceeding. Enter the router's IP address in your web browser’s Address bar and press [ENTER]. Log in with your administrator password. The default password is admin. If you changed it, use that password instead then click Sign in. Click Internet Settings and click Edit. 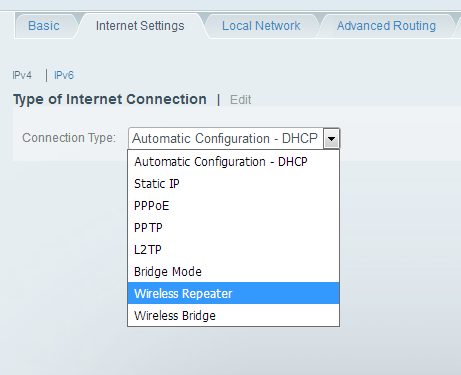 Select Wireless Repeater on the drop-down menu. 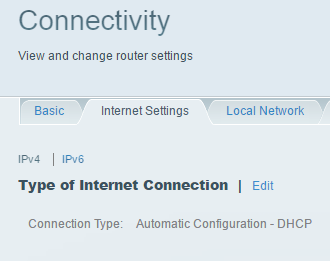 Enter the main router or access point’s Network name(SSID), Network band and Security Mode. NOTE: The supported encryption methods are WPA-Personal and WPA2-Personal. As soon as you have selected the Security Mode, you can enter your main network's Password in the field. Click Apply, then click Ok to save settings. On the Warning prompt, click Yes to continue. Once your Linksys EA7500 has turned into a Wireless Repeater, you will need to check on your main router or access point’s DHCP Client Table for the new IP address of your Linksys EA7500. You will have to use this new IP address to log in to the router’s web-based setup page if you need to configure it later on. 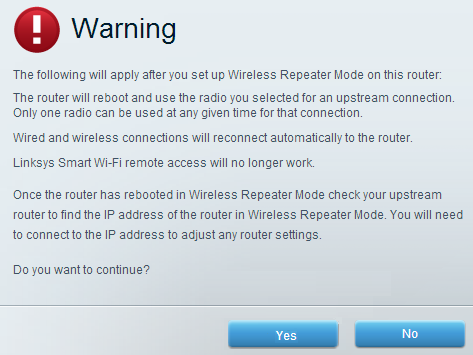 If the Linksys Smart Wi-Fi Router cannot find the main router or access point, you will receive the following message. Clicking Ok will take you back to the Internet Settings tab where you left off. 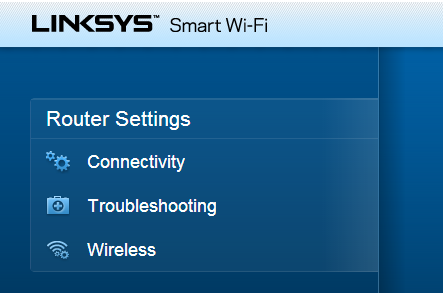 NOTE: You will not be able to save the settings if the Linksys Smart Wi-Fi Router cannot find the network. Make sure that the wireless settings of the Linksys Smart Wi-Fi Router are exactly the same as that of the main router or access point. When in Wireless Repeater mode, you will only have access to the Connectivity, Troubleshooting and Wireless tools that are supported under Repeater mode. 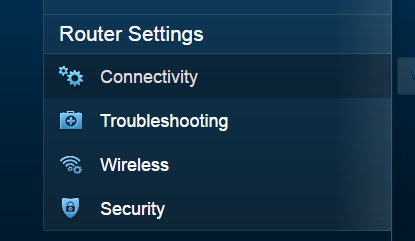 Connectivity – This tool allows you to edit the Wireless Repeater settings under the Internet Settings tab. Troubleshooting – This tool allows you to diagnose and troubleshoot connectivity issues on your network. Wireless – This tool allows you to broadcast both frequency bands and customize both wireless settings on the router setup as Wireless Repeater mode.